World-wide, thousands of people took part in the March for Science on Earth Day last Saturday. The Guardian‘s headline declared “Global ‘March for Science’ protests call for action on climate change” as the reason for the marches. Calls to action and defending scientists from attacks on the legitimacy of climate science, were the objectives. First celebrated in 1970, Earth Day events are held to demonstrate support for environmental protection. The wider goals of this demonstration are laudable, but I have two ‘howevers’ around the March for Science action. First is the irony of the marches – significant volumes of new carbon were emitted to the atmosphere from the vehicles used by participants. Using the average emissions factor defined by our Environment Ministry for petrol vehicles and an average distance travelled of 25km, each participant released around 6kg of new carbon dioxide. The second ‘however’ is that actions, not more words are now needed if global warming is to not exceed 2°C. That is the goal of the climate agreement that our government has committed to. 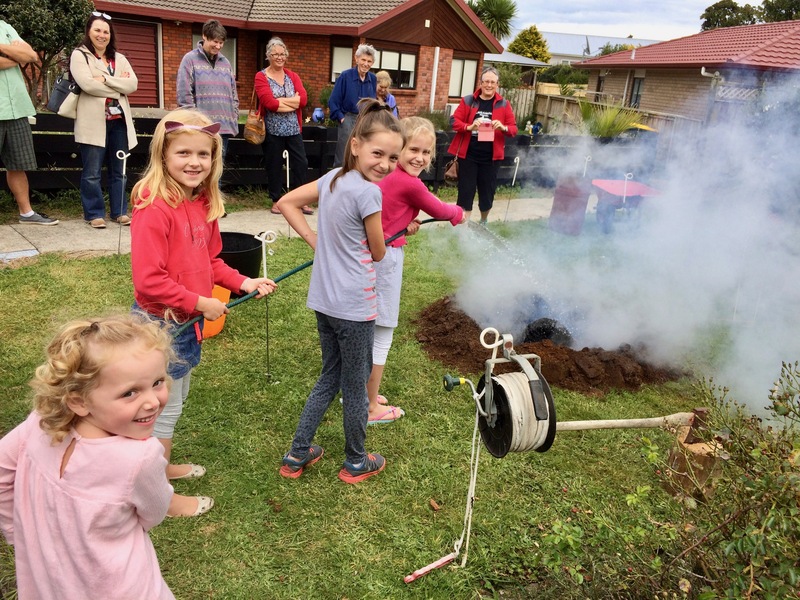 One of the few Earth Day events that actually achieved a reduction in atmospheric carbon dioxide (CO2) levels, was the Charcoal Fire event at St Andrews Anglican Church in Pukekohe last Sunday. 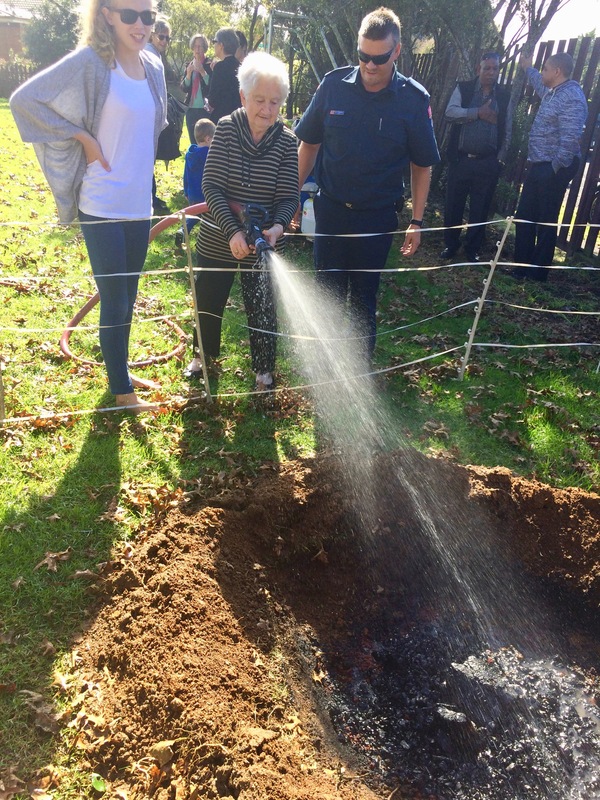 This event involved burning wood to make biochar. The char was buried, inoculated and two peach trees planted on top. For each person attending that event, an estimated 3kg of carbon dioxide was removed from the atmosphere and buried away for a very long time. Plus the new trees will sequester more carbon for many years. It may be that the Marches for Science had an impact on US politicians. It is clear that the Pukekohe event had an impact on reducing global warming. The carbon cycle is the movement of carbon between the atmosphere, oceans, soils, and plants. One part of that cycle involves trees and plants taking carbon dioxide (CO2) out of the atmosphere and converting it to carbon which becomes embedded within the tree, and to oxygen which is released back to the atmosphere. When a plant dies naturally, much of it’s carbon is released back to the atmosphere, and becomes available to other plants to absorb and continue the cycle. Soil contains one of nature’s largest stores of carbon which is slowly released to the atmosphere or locked away as fossil fuels. This balance in the carbon cycle has been a feature of our environment for millennia. We humans upset that balance when we add new carbon to the atmosphere by tilling the soil, extracting and burning fossil fuels, and when we cut down forests. We have been doing this for over 100 years, which is seen in the ‘hockey stick’ graph that charts rising atmospheric CO2 levels. Last week’s cyclone-determined weather was mild for us in Pukekohe, but severe on our east coast and catastrophic further south in the Bay of Plenty. It is likely that a future cyclone will deal equally severe blows to us and our west coast communities. Whilst we cannot forecast severe weather impacts for specific areas, NIWA have warned North Islanders to brace themselves for more flooding events. And scientists are finding more linkages between our carbon emissions and extreme weather events. Last month, Nature.com published an article on the influence of anthropogenic – aka “human caused” – climate change on extreme weather events. Are we, individually and collectively, prepared to take a punt on future catastrophic weather events bypassing us? The people of Edgecumbe would give a different answer to that question from those not yet seriously affected. Those who do not consider the risks are burying their heads in ever-warming sands, for one thing is clear: extreme weather events are now part of our future. The Insurance Council agrees. It was reported last week, that the Insurance Council and Local Government NZ have worked together for about three years to explore changes to building consenting processes. Their goal is to minimise property damage during severe weather events. But Prime Minister Bill English does not agree. He was reported last week as saying that it does not matter “too much”, what is causing the weather we have experienced over the past three weeks. He went on to say that climate change as the cause, is something he does not want to spend time thinking about. It is our grandchildren’s future that he dismisses so casually. So what can we as individuals do that our government do not want to think about? One action is to reduce our household carbon emissions. Which means travelling less, buying only what we need, reducing waste, saving energy and more. An easy-do action, is for us to take carbon out of the atmosphere. Atmospheric carbon now exceeds 400 parts per million, and to bring that back to a level that will keep global warming below 2°C, carbon needs to be removed from the atmosphere. At The Charcoal Fire event on Sunday 23rd April, you can learn the means to achieve that. Making and burying biochar is a win for carbon sequestration and a win for the fertility and water holding capacity of our garden soils. And planting fruit trees on top of that biochar is a further win for growing healthy, nutritious food. 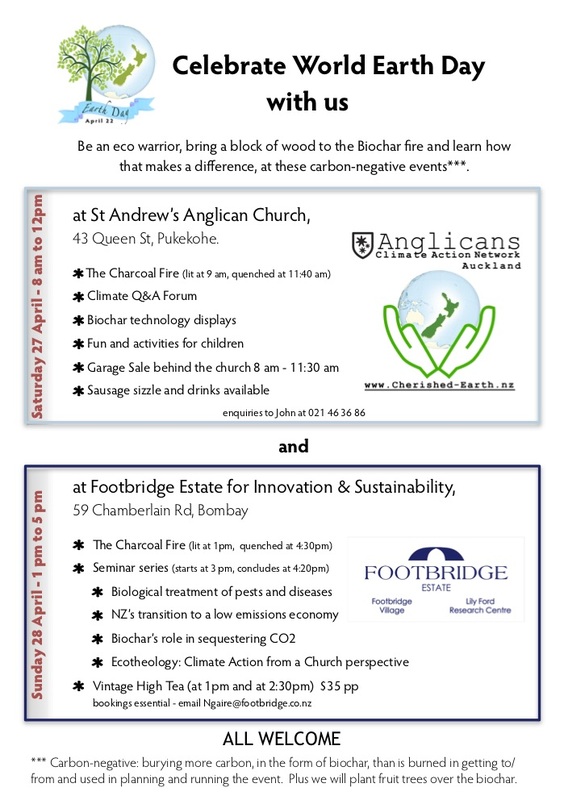 Join us at 18 Wesley Street in Pukekohe, anytime between 8 am and 11 am this Sunday (23rd April) to learn how to make biochar as a win win win climate action. “Flash flooding is expected across the upper North Island over the next two days” trumpeted the news headlines last Tuesday morning. What, again? This is the third or fourth time this autumn that gutters and drains needed to be cleared of leaves in preparation for a deluge. There was a time, not too long ago, that such flood warnings were issued for only “1 in 100” year events. “1 in 100” does not mean that it occurs only once every 100 years. It means that there is a one per cent chance of such an event occurring in a single year. Statistically, a 1 in 100 year event may occur many times in one year, but the average over a number of years, will be one. It is wishful thinking to conclude that the next 500 years will therefore, be flood-free. Given the clear impact that our carbon emissions have on global warming, we can expect only more extreme weather. This may be why we no longer hear warnings of 1 in 100 year events. The climate is changing so fast, that scientists have not been able to reassess their frequency. One thing that science is getting better at, is the attribution of extreme weather events to man-made causes. The World Weather Attribution Project is a collaborative project with Climate Central that aims to achieve near real-time attribution of extreme weather events around the world. NIWA goes on to say that April, only six days old, is shaping up to be an abnormally wet month. Five time the monthly rainfall was expected to fall in the last couple of days, with more heavy rainfall events expected. So the Franklin ward, and Hauraki and Thames-Coromandel districts, should expect more damage from storms like that earlier in March that was declared a medium-scale adverse event. How many times do we need “adverse events” to be declared before we realise that we need to take serious action on climate change? Repeatedly clearing drains and gutters only normalises the situation. The actions we must take must be focused on the dual fronts of reducing our carbon emissions, and on clawing atmospheric carbon back from our oceans and atmosphere. A clear and strong climate action celebrating this year’s International Earth Day is planned for St Andrews Anglican Church in Pukekohe on Sunday April 24th. Biochar will be created and trees planted at “The Charcoal Fire” event. 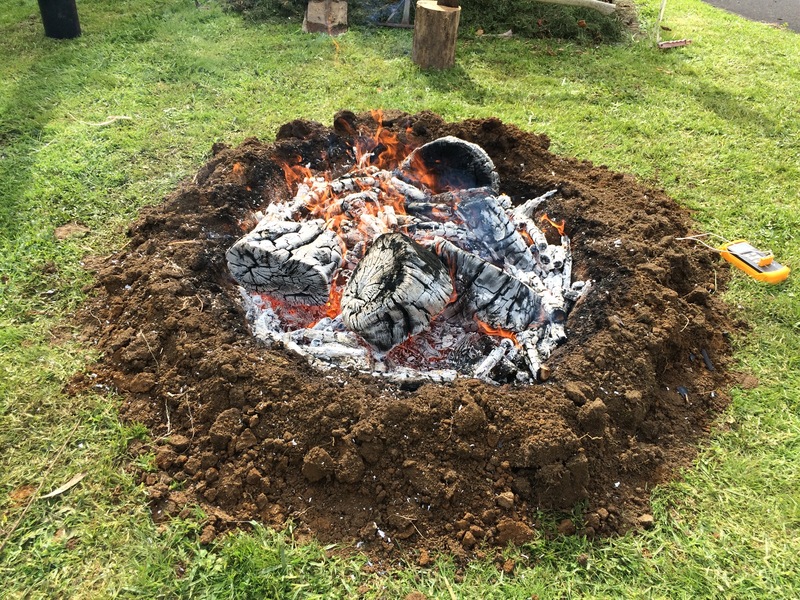 Join us – bring a gold coin or one kilogram of dry wood for burning anytime between 8:00 and 11:00 am. The early stages of biochar production in a kontiki-style earth kiln. Climate doomsayer Guy McPherson was in Auckland last week, talking about Runaway Abrupt Climate Change. I do not call him a doomsayer to belittle him or what he has to say. For he is saying things that need to be said, things that too few want to acknowledge, let alone take action on. When McPherson says “the situation (climate change) is far worse than it was (in 2014)”, the scientific evidence proves him right. Atmospheric carbon levels have now exceeded 400 ppm and 2016 is projected to be the hottest year on record. But then he goes on to say, “There’s no point trying to fight climate change … there’s nothing we can do to stop it”. His denial of our will to survive is beyond defeatist. For sure, the task of bringing atmospheric carbon back to levels the earth can sustain is ginormous. But not even worth trying for? And do two things we must, if McPherson’s non-future is to be avoided. One is to eliminate burning fossil fuels. As unlikely as that is, it will not avoid catastrophic climate change as the carbon already in the atmosphere will continue to drive warming for decades yet. Second is to take carbon out of the atmosphere. High tech Carbon Capture and Storage processes are seen by many as the way to save the world. But they either do not work yet, or are too expensive. While politicians wait for technologic fixes, the risks become ever more dire. There are two low tech means to sequestering atmospheric carbon that could be implemented from tomorrow if there was the political nous. First is planting trees. We can and should do that, but it will have only a small impact in the time scale McPherson talks about. Second is to make biochar and bury it in agricultural soils. Making biochar from forestry and municipal waste would give us the win-win-win of renewable biofuels, improved soils and less atmospheric carbon. This sounds an easy do but the scale of the challenge before us is daunting. To hold global warming to under 2°C, atmospheric carbon needs to be under 350 ppm. If emissions reductions had begun in 2005, a reduction rate of only 3.5% per year may have sufficed. Starting today, the required reduction rate is 6% and if delayed until 2020, then it is 15%. Biochar sequestration can achieve a 12% rate. So doable it is if we start now. As discussed last week, it is our perception of the risks that determines whether we take precautions or not. If we assess a low risk to catastrophic climate change, Guy McPherson will be proved right.